Here’s another reflection on drinks in TV shows. Stolichnaya is a Russian vodka produced from wheat and rye grains. It was the first Russian vodka to be imported to the U.S. – in 1965, the first bottles of Stolichnaya appeared at select retail stores in Brooklyn. It became more widely distributed in 1972 when PepsiCo struck a barter agreement with the Russian government to enter that market. Stolichnaya was also the first to launch flavored line extensions (in 1986), and in August of 2009 added its 10th flavor, Gala Applik. 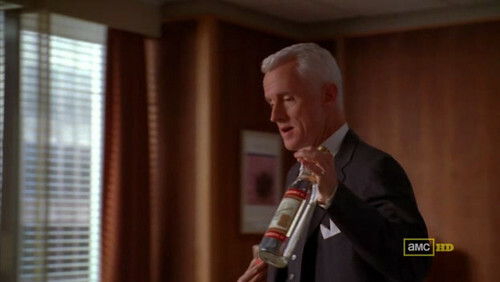 Roger Sterling bursts in Don Draper‘s office with a gift from his honeymoon – a pack of cigars and a bottle of Stolichnaya. Erik, keep up the good work. It’s excellent. It’s really strange isn’t it. Great placement and a free one. Also, it created “I want to buy this product” effect. I was watching Will & Grace the other day and in one scene Karen’s maid Rosario came from the store with bottles of liquor, saying: They didn’t have vodka so i bought Stoli.